In today's world, it may be easy to take photos on your cell phone, but really, are we going to hand down heirlooms of endless selfies to our children and grandchildren someday? I know as a mother, I look at my son and daughter right now, and it is so hard to remember what they looked like just one or two years ago. Everything is moving so fast, and professional photos are a way to slow things down and always be able to remember that moment....that age...their little faces...how they looked when they were laughing...how they looked when they were crying...how they looked when they were wondering and playing. I capture that for you and give you something to pass on to your grandchildren. It's your legacy! What do you want it to look like? We can never get these moments back, but we can freeze them and always be able to go back to that exact moment in time and feel the happiness and love that we felt that day. Session to be completed within the first two weeks of life. Choice between having lifestyle, in-home session or styled session in the studio!. Families are welcome and encouraged to be a part of this special day. Baby sessions are good for babies age 1 month through 18 months. Baby sessions are meant to highlight babies only - this is all about your little one and making him/her the special subject of the day. Sessions can be held in home, at the studio, or on location. Think favorite toys, family heirlooms, interactions with Mommy & Daddy, or simply capturing a day in the life of your baby in your home to remember little moments such as breastfeeding, story time, bottle feeding, eating solid foods for the first time…if you have a vision, let’s chat! Baby’s siblings, parents, and grandparents are welcome in all sessions! Newborn session includes choice of studio session or in-home lifestyle session within first two weeks of life. Each session includes 10 edited high-resolution digital images chosen by you to be edited. Additional images can be chosen for editing as desired per the current product list. These sessions are perfect to compliment personal pictures and monthly milestone pictures to include in a baby book to document growth throughout the year! All paid in full senior sessions include a complimentary family session (scheduled separately) with no additional session fee! · Available add-on: Studio session for sport/extra-curricular composite photo for $125.00 to include digital rendering and 16x20 print of the image. Family lifestyle/posed combination sessions in home, on location, or in the studio. Family sessions are for up to two adults and up to four children and will include group shots, shots of parents together, individual children, siblings together, and individual children with each parent. 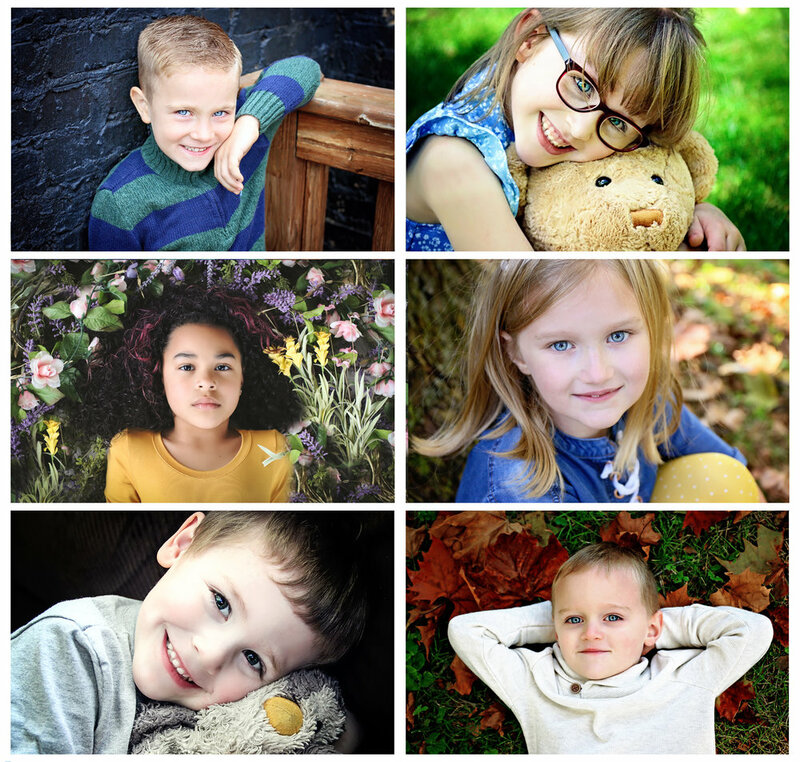 For extended family sessions, add $25 per each additional person over 6 to the session fee. Capturing the magic of childhood is what the imagination series is all about! Based upon your child's personality and interests, a concept will be created and made into a fun work-of-art keepsake! The final product is the created image rendered onto a stunning metal print with float mount. Digital image is included. Prices below are all inclusive for session, metal art, free digital file, and sales tax is included! Children LOVE these to hang on the walls of their bedrooms! It is a great heirloom piece. Wedding day coverage to include packages below. Please be advised that I do not provide reception coverage. All wedding packages include a complimentary engagement session prior to the wedding (not transferable). · Ceremony/ bride & groom photos only: $900 with $350 print credit. · Ceremony, bride & groom, bridal party, family photos: $1100. with $350 print credit. 4 hours coverage maximum. · Getting Ready, Ceremony, bride & groom, bridal party, family photos: $1500 $350 print credit. 6 hours maximum coverage. No-interest financing available! Terms vary based on client needs. 50% of session fee due upon booking to secure date. Please inquire with specific requests for payments. All sessions will include an ordering session following the session to choose the images for each order and review the available products. Please note that unless specifically outlined, digital files are a separate purchase from the session fee. Prices subject to change at any time without prior notice. Contracts are required for sessions. Located at the Park Trades Center Building in downtown Kalamazoo! Parking is located on the street at the meters around the building (free after 5 and all day on weekends). When coming from West Main/Stadium Drive, go down West Michigan Ave. Turn left onto N Park Street (you’ll see the big green sign!). Once on Park Street, stay to the right and look for Eleanor Ave. Turn right onto Eleanor. Once on Eleanor, turn left onto Church Street. Cross W Kalamazoo Ave. and park at a meter around the building! Children whose parents display family photographs in the home grow up with greater confidence and sense of belonging, it has been revealed. Photography in the home reportedly makes children feel valued and gives them a rich understanding of where they come from. Research conducted by Venture New Generation Portraits found that the number of photographs parents display of their children is heavily influenced by how many photos of themselves they remember in their homes when growing up. A survey, questioning 1,000 parents, found that the UK is a nation obsessed with keeping loved ones close, with 78 per cent of us keeping between one and fifteen pictures of our family around the home. However, those who have grown up without photos in the home are less likely to go on to display any of their own children presently, which could in fact be damaging their children's image of self as they mature. Professor Geoff Beattie, Head of School and Dean of Psychological Sciences at the University of Manchester: 'We cannot underestimate the power of photographs to keep us feeling linked to others and belonging. They cement us into our networks. The majority had a favourite photo and of those, 58 per cent said it was taken with family, a partner or another loved one, and 45 per cent said it reminded them of a happy time. Richard Mayfield, Director of Photography of Venture New Generation Portraits, adds: 'Our research shows how important it is to find the time to capture the real essence of a family. In today's time-pressured world it is becoming increasingly difficult to spend good quality family time, however when we look at photographs, we remember how we felt when that picture was taken. The survey found that 38 per cent of those who grew up with no photos in the house now don't display family photographs in their own homes. Professor Beattie said: 'When children grow up surrounded by photographs, it gives them a richer understanding of where they come from, which helps with confidence. Previous research has also found that 71 per cent of parents thought that having pictures displayed around the home boosts a child's self-image and self-esteem, with 90 per cent stating that they believe children to be more aware of their own image than 10 years ago. This is your legacy. This is your family. This is you! This is your family's record. By printing your photos and ordering tangible products, you are preserving your family's record and ensuring that your children, grandchildren, and great-grandchildren have your record. You want it in your hands. You want it displayed. You should be proud of what you have created! I practice what I preach. I have walls and walls of framed photos, Story Blocks, gallery wraps, and metal prints proudly displayed in my home. My children love seeing them! They tell people who visit about their photos. At family gatherings, we remember the days together when we took our photos. These are our memories. These are your heirlooms! It is your art. You want to own it. Hi. This is me. My name is Stephanie. What’s up?! :) Here is my best attempt at a self-portrait. It makes me feel so lame…I mean…I love taking photos of other people, but having my own photo taken…not so much…so I feel your pain if you feel awkward getting your picture taken! (I totally practice what I preach…this is our most recent family photo from the amazing Tara Fletcher Photography!) We take family photos at least once per year, sometimes twice…these two change so much, and I want to freeze every second that I possibly can! These are my favorite people in the entire world…they are my reason for doing everything that I do. I plaster my walls in my home with pictures of all of these guys…they are the best. You guys,,,I am totally informal. When you have a session with me, we are hanging out. I am all about making people comfortable and having your session not be a whole thing… Yes, you can dress up and look beautiful, but I want you to have fun and feel as though you are just spending time with a friend. If you have little ones, I am going to be on their level and making him/her/them feel special. Little ones are my people, ESPECIALLY toddlers. I LOVE toddlers and babies. We just get each other…if you have had a bad experience in the past with photos, I promise you that I will take the time and be very patient to get things right so that the outcome of your session is one where you have so many images that you cannot possibly choose, and that you cry when you look at your pictures because you feel that emotion come through. As a mother of two kids under age 5, there is not much that makes me bat an eye. You don’t have to act perfect with me. My daughter is a nut, so there is nothing that can phase me! NOTHING! :) :) I want this process to be easy, fun, and worth it for you. I am not a salesperson…I am not judgmental…I am just here to make people happy and share my talents to give you something that you will be able to have forever. These are my two skunks, Piper and Max. They are pretty cool. I am a big fan of them. You’ll see lots of photos of them in my galleries because they are my models, and I think they are pretty adorable. Please fill out the following form for a no-hassle inquiry! How Did You Hear About Finkanie Photography? Thank you for contacting me! Please allow 48 hours for a response to your inquiry.